Going somewhere? 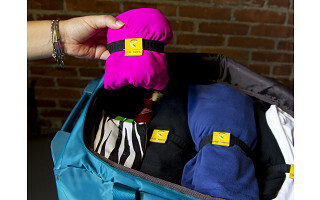 Don’t forget to pack with rollnband—a clever solution to keep your suitcase organized and your clothes ready to wear. 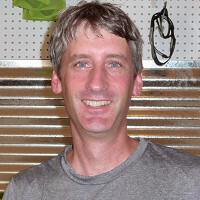 With a background in travel goods, Todd Masshardt knows a thing or two about packing. For example, he knows that rolling your clothing is the key to maximizing bag capacity and reducing wrinkles. He also knows that until he invented rollnband there was no easy way to keep packed items rolled and securely in place. Manufactured in the USA, rollnband is made of woven elastic wide enough to stop rolled clothes from coming undone without snagging or leaving a mark like an ordinary rubber band would. If you’re packing for a child, you can roll entire outfits together so little ones can dress themselves without, well, looking like they dressed themselves. The rollnband also makes it simple to tell what’s clean and what’s not. After you’ve worn an item, just re-roll it and reverse the band to gray. Whether you’re a world traveler, backpacker, biker or a weekend warrior, don’t leave home without rollnband. Happy packing. What inspired me to create rollnband was the lack of options for packing on the market for people who roll clothes. Rubber bands and packing cubes did not work for me. I wanted to invent something that was durable and allowed me to pack and utilize all the space in my pack while staying extremely organized. I wanted to pack like a pro. rollnband has acheived this for me and it also has lots of other everyday uses. roll it, band it, pack it. These were the first words my wife used when she saw the product I was developing. rollnband has come a long way from the first prototype to where it is today. I am very excited to share this with you as it has become a mainstay of the way my family and freinds now pack when traveling. I am so excited and grateful to the wonderful team at The Grommet for featuring rollnband. I will be here to answer any and all questions you have about rollnband. Thanks for all your support and remember, "roll it, band it, pack it." Going somewhere? 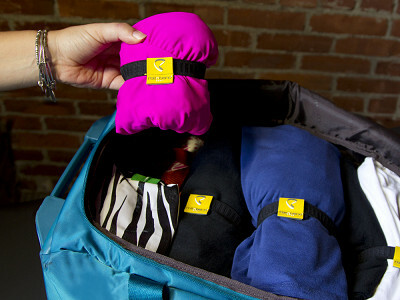 Don’t forget to pack with rollnband—a clever solution to keep your suitcase organized and your clothes ready to wear. With a background in travel goods, Todd Masshardt knows a thing or two about packing. For example, he knows that rolling your clothing is the key to maximizing bag capacity and reducing wrinkles. He also knows that until he invented rollnband there was no easy way to keep packed items rolled and securely in place. Manufactured in the USA, rollnband is made of woven elastic wide enough to stop rolled clothes from coming undone without snagging or leaving a mark like an ordinary rubber band would. If you’re packing for a child, you can roll entire outfits together so little ones can dress themselves without, well, looking like they dressed themselves. The rollnband also makes it simple to tell what’s clean and what’s not. After you’ve worn an item, just re-roll it and reverse the band to gray.